For many (Mainstream-guys? ), 3% is the breaking point at which corporate financing costs would get too expensive, the equity market would lose its luster and growth momentum would fade. Marty Mitchell, a former head government bond trader at Stifel Nicolaus & Co. and now an independent strategist says: "A lot of people point to 3% on the 10-year as the critical level for stocks," noting that higher rates signal traders are realising that quantitative easing policies really are on the way out. As a reminder: The S&P 500 Index has returned 7% this year, once reinvested dividends are taken into account, and the U.S. equity benchmark is already more than 1% higher than the level at which a Wall Street strategists' survey last month predicted it would end 2018. In fact, investors had largely been better off owning stocks for fixed income than short-term Treasuries. Not so anymore: two-year Treasuries yield 2.12%, compared with the 1.76% dividend yield on the S&P 500! 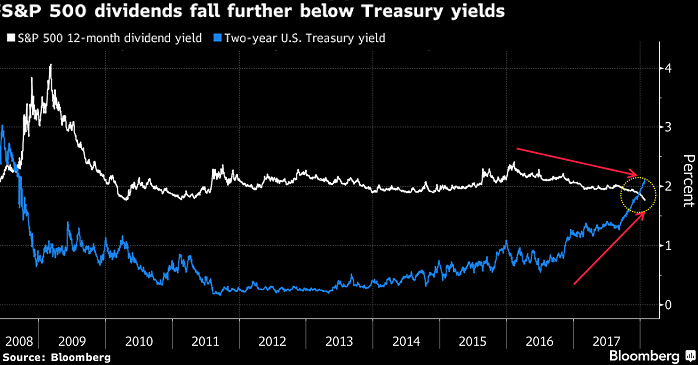 Another market commentary: "Around 2.9 or 3 percent on the 10-year is where we begin to run into trouble," said Peter Tchir, head of macro strategy at Academy Securities Inc. "All of this is about the speed of the adjustment. If we are at 3 percent by the end of this week, I don't see stocks surviving that very well. And rising yields already make it harder for some dividend stocks to do so well." ...few expect a move of that magnitude.